The one-hour chart for BTC indicated an uptrend from $3,850 to $4,013.02, after which the price of the coin started to decline. The downtrend extended from $4,013.01 to $3,977.77. The largest token drew resistance at $4,013.02. However, due to the falling price, the token failed to mark definitive support. Bollinger Bands pointed towards a bearish market as the moving average line was above the candlesticks. The bands appeared to have diverged, suggesting increased volatility in the market. Awesome Oscillator marked a weakened bearish trend. Chaikin Money Flow indicated a bearish market for the coin as the marker was under the zero mark. 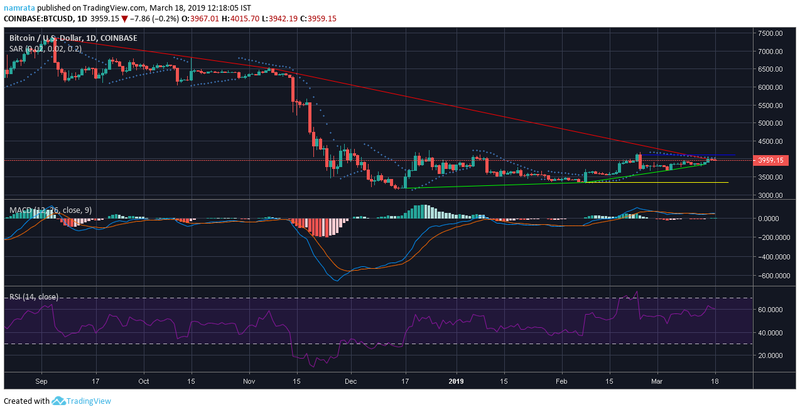 According to a majority of the indicators like Bollinger Bands, Awesome Oscillator, Chaikin Money Flow, and Parabolic SAR, a bearish trend was forecast for the coin.